Here’s a web comic by artist Darryl Cunningham from the UK. Cunningham struggled through depression and crushing shyness himself, before finding a creative outlet in comics. His empathy shines through: Darkness. 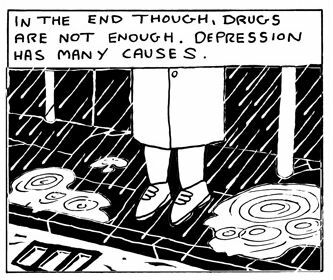 I’m a big fan of comics that cover this material, as people struggling with depression often struggle even to pick up a book, let alone wade through text. Graphic novels, comics, whatever you choose to call them, can offer a user friendly interface into a world that offers some comfort. I’ll be featuring more of his comics in coming weeks.